I have a confession to make...I've not read the last 2 books in the Harry Potter series. Until now! I was very excited to get into this audio book. I knew nothing about it. I purposefully didn't see the film so I wouldn't ruin the book when I finally did read it. I went in blind. This book is so full of adventure!I'm practically obsessed with this world. To be fair, I think most people are. It is so creative and eevrything about it intrigues me. The narration is very good. I think Stephen Fry is getting better. I'm really feeling the different character voices he's created. It truly is an enjoyable audio book. I'm listening while I do my chores and it helps me take my mind off the mundane. Totally worth it to me. 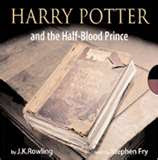 You need to add Harry Potter to your list of audio book must haves. I'm blown away! One more book! How will it all end?! I don't know, I've not read it or seen the film so don't tell me anything!